One of the first recipes I jotted down on my cookbook before realizing I was noting it down from a Food Blog! I can never have ‘enough’ Chocolate Cake recipes and this one looked so rich and chocolatey that I couldn’t give it a miss.During my hunt for recipes for the Chocolate Cake event,I remembered this recipe and decided to give it a try.This one being a no-frost cake was tempting enough.Not that I dislike frosted cakes,on the contrary,I ♥ them,but sadly my weighing scale gives me nightmares. I went ahead and frosted it anyway..just so that I could use up the leftover ganache-white and dark.See,I used up the leftovers..so I can be pardoned:).Followed this five-minute frosting idea from Deeba[who else].The result was a spectacular looking cake[if I may say so myself:)] with just a few minutes of effort. I followed the recipe verbatim from Malabar Spices.Definitely on my bake-again list.Moist and chocolatey with a hint of cinnamon..l♥ved it!! Sift the flour with soda,salt and cocoa powder. Beat the eggs slightly and keep aside. Powder the sugar with the cinnamon[if using] and beat with the melted butter till the sugar dissolves. Add in the beaten eggs and vanilla essence and beat well. Blend in the oil and yogurt till well mixed. Add the flour slowly blending it in as you go-do not add at one go-the mix should be smooth textured. Now add the powdered nuts-do not overmix after this stage. Grease an 8’ round cake tin and sprinkle with flour. 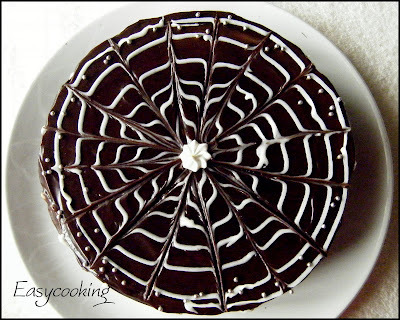 I frosted the cake with some dark chocolate ganache and made a spidey web pattern using the white chocolate ganache.This step can be skipped totally if you want a plain cake.It tastes delicious either ways!! Have you sent in your entries for The Best Chocolate Cake event yet? Hop on to Ria's blog to check out my guest post for her..:). I love chocolate cake a lot!!! 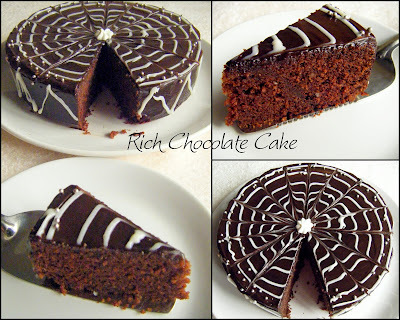 iam drooling over this cake..Looks yummy yumm..
lovely moist cake again..love the frosting..
Looks beautiful Divya! Wish could have a slice even though my bathroom scales will start creaking for obvious reasons!! oh..thats lovely.. i love the way u hv decorated it....i m controlling myself from baking..dont tempt me :)my poor scales!! Wat a beautiful work Divya...fantastic!!!! Wow that is one of the best beautiful cakes i have seen. Looks gorgeous. Beautiful presentation Divya! I bet the cake tasted fab! Drooling..Your cakes are amazing! I wont say no to get caught in this spider web..
Wow chocolate cake looks delicious.My 1st time here and I am loving your space.Do drop by simply.food sometime.I willl send cake for the event too. Excellent, i cannot take out my eyes! Yummy! Lovely handwork with the icing. It looks beautiful! Wow, the cake looks beautiful! Stunning Cake Divya! Love this much chocolate. Great presentation! 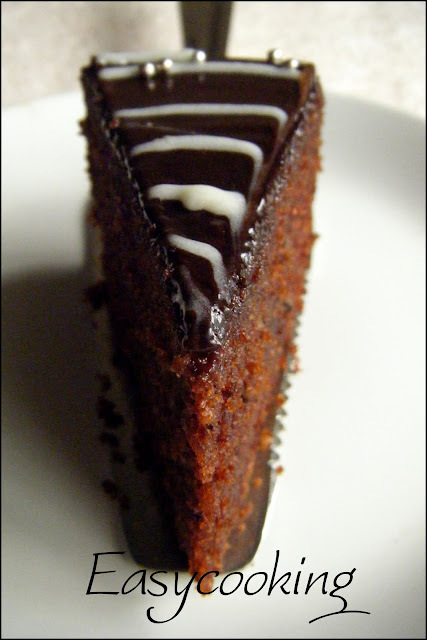 I love chocolate cakes..This looks heavenly! This looks amazing, the pic of the slice caught my eye. I'm hemming and hawwing about what cake to bake for my son's b'day (family party) today - I think this is the one! divya, didn't know that u had baked this and liked it! hi hi!! Ur photo of the slice is too gorgeous. Have to try the frosting on the cake now. Thanks for the tip.